Long-term fluoroquinolone-associated disability (FQAD) after fluoroquinolone (FQ) antibiotic therapy appears in recent years as a significant medical and social problem, because patients suffer for many years after prescribed antimicrobial FQ treatment from tiredness, concentration problems, neuropathies, tendinopathies, and other symptoms. The knowledge about the molecular activity of FQs in the cells remains unclear in many details. The effective treatment of this chronic state remains difficult and not effective. The current paper reviews the pathobiochemical properties of FQs, hints the directions for further research, and reviews the research concerning the proposed treatment of patients. 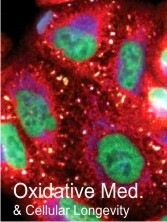 Based on the analysis of literature, the main directions of possible effective treatment of FQAD are proposed: (a) reduction of the oxidative stress, (b) restoring reduced mitochondrion potential ΔΨm, (c) supplementation of uni- and bivalent cations that are chelated by FQs and probably ineffectively transported to the cell (caution must be paid to Fe and Cu because they may generate Fenton reaction), (d) stimulating the mitochondrial proliferation, (e) removing FQs permanently accumulated in the cells (if this phenomenon takes place), and (f) regulating the disturbed gene expression and enzyme activity.